For over three decades the American Israel Public Affairs Committee (AIPAC) has been an effective lobby within Congress to ensure that Israel remains strong militarily and economically, and endures as a national homeland for Jews. While acknowledging its effectiveness, AIPAC critics maintain that AIPAC is an ex-officio arm of the Israeli government which shamelessly manipulates the political process whenever it decides that there is a perceived threat to Israel’s interests. 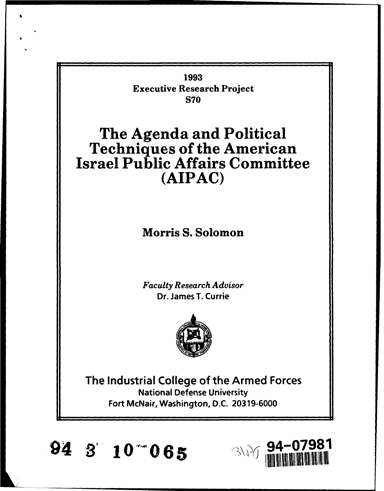 This paper will examine AIPAC’s origins, its structure and agenda. and its lobbying techniques to better understand why AIPAC is considered by many to be the most influential Congressional lobby. Since 1959, the American Isracl Public Affairs Committee has been the only domestic organization registered to lobby for the American Jewish community in support of Israel. Unlike other Jewish organizations, donations to AIPAC are not tax exempt. Consequently, AIPAC does not have to abide by Internal Revenue Service restrictions that apply to tax exempt groups, which forbid direct lobbying of Congress and the Executive Branch. Moreover, unlike other domestic organizations that lobby for foreign governments and receive funds from them, AIPAC receives no funding from Israel. Rather, its funding comes from appeals to its thousands of members. AIPAC is governed by a group of.-eighteen officers, most of whom are leaders of major Jewish organizations. These offices are selected every two years by an executive committee comprising the presidents of thirty-eight major American Jewish organizations that claim a membership of nearly five million. The AIPAC officers meet monthly and only deal with high visibility issues. In reality, the officers are normally wealthy, influential, and widely respected members of the American Jewish community. Likewise, the office of AIPAC president is a titular position. The key position within AIPAC is that of executive director. The executive director is AIPAC’s chief administrative officer who is responsible for the lobby’s day-to-day operations. Kenen occupied the position from 1954-74. He was followed by Morris Amitay, who at his selection was a legislative aide to Connecticut Senator Abraham Ribicoff. Since 1981, the executive director has been Thomas Dine, who monitored national security issues for the Senate Budget Committee and was subsequently a legislative aide to Senators Edward Kennedy, Frank Church, and Edmund Muskie. AIPAC has a non-sectarian staff of 140 highly intelligent and committed individuals together with an annual budget of approximately $15 million. The largest number of staff is centered several blocks from the Capitol in a non-descript mid-rise building. Even though it lacks identification as AIPAC headquarters, the building is tightly guarded with uniformed officers and remote control entering devices. The remaining staff members are in seven geographical regions around the United States plus an office in Jerusalem. While one-third of the Washington staff are clerical and administrative, the remaining staff members are specialists in fields ranging from conventional weapon tranfers to advanced weapon systems technology. For example, during an interview conducted on 20 November 1992 with three AIPAC staff members, one was a former academic who specialized in Middle East policy analysis, another was a former United States air force colonel who thoroughly understood the military, and the third was a weapons expert who had previously worked in private industry. Even though one of the three was not Jewish, they were unified by their commitment to the survival of Israel. This source spoke on a non-attribution basis, a reflection of AIPAC’s power, because she feared that negative comments about AIPAC could jeopardize a possible position in the Clinton Administration. The staffer added that AIPAC often skews the United States’ policy options in the Middle East. For example, if Israeli interests are challenged in the Senate, AIPAC immediately organizes a Senate resolution, sponsored by a pro-Israel senator. Then through its personal and constituent networks, AIPAC secures the support of at least two-thirds of the Senate to forestall any perceived anti-Israeli issues. “There are a lot of guys at the working level up here [Capitol Hill] who happen to be Jewish, who are willing to make a little bit of extra effort and to look at certain issues in terms of their Jewishness, and this is what made things go in the last couple of years. These are all guys who are in a position to make the decisions in these areas for those senators. You don’t need that many to get something done in the Senate. All you need is a certain commitment to get something done and, if guys are willing to put time into that instead of a million other things they have to do, if they’re willing to make a couple of calls, if they’re willing to become involved, you can get an awful lot done just at the staff level..The senators have a million things to do and they’ll take the recommendations [of their aides] most times. “Prominent journalists and media observers will show you how to identify anti-Israel bias and respond in pro-active ways. Responding to Anti-Israel Activities In The U.S.
For 25 years, the anti-Israel campaign has been trying to drive a wedge between the U.S. and Israel. This session suggests countermeasures. The recent resurgence of isolationism threatens foreign aid to Israel. This session focuses on ways to help unite the pro-foreign aid forces in this country.